About 30,000 cases of hummus are being recalled nationwide due to a possible contamination with listeria, a potentially fatal food-borne disease. Listeria-contaminated ice cream caused three deaths earlier this week. 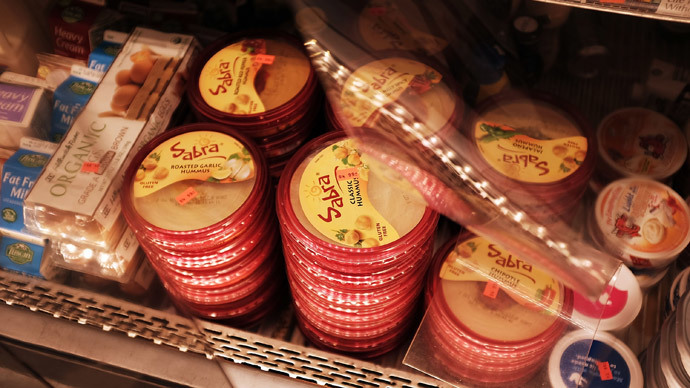 The Sabra Dipping Company announced a massive recall of its Classic hummus on Wednesday after several packages in Michigan tested positive for listeria. There have been no reports of illness related to hummus so far, Michigan Department of Agriculture and Rural Development spokeswoman Jennifer Holton told AP. I've never heard of Listeria so I'm gonna go ahead and eat this hummus anyway. In most cases, listeria can cause high fevers and nausea. Infections can be fatal to people with weakened immune systems and to young children, and cause miscarriages. Eight people in Kansas and Texas fell ill recently, and three of them died, prompting a massive recall of Blue Bunny ice cream products. The Centers for Disease Control and Prevention estimate about 260 people die from approximately 1,600 cases of listeria every year, a rate of about 16 percent. In comparison, less than 1 percent of a million salmonella cases annually are fatal.